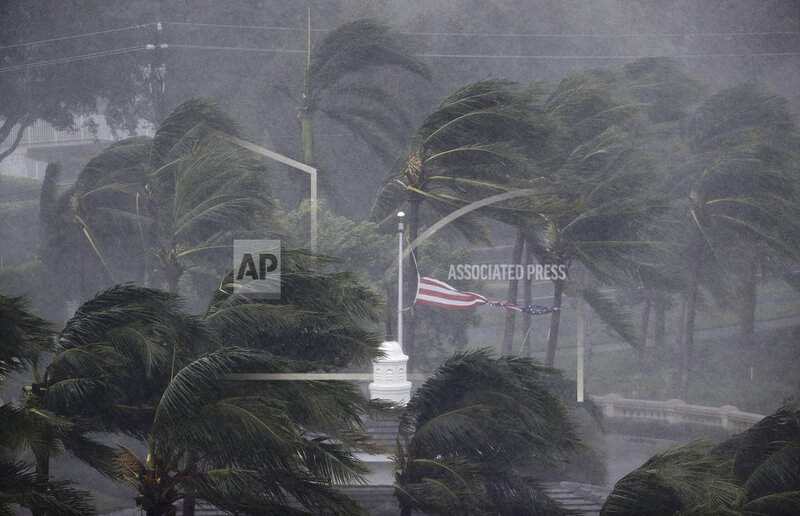 MIAMI (AP) — A monster Hurricane Irma roared into Florida with 130 mph winds Sunday for what could be a sustained assault on nearly the entire Sunshine State, flooding streets, knocking out power to more than 1.8 million homes and businesses and snapping massive construction cranes over the Miami skyline. The nearly 400-mile-wide storm blew ashore in the morning in the mostly cleared-out Florida Keys and was expected to make a slow, ruinous march up the state’s west coast, hitting the heavily populated Tampa-St. Petersburg area by Monday morning. Many streets were underwater in downtown Miami and other cities. Roof damage and floating appliances and furniture were reported in the low-lying Keys, but the full extent of Irma’s wrath there was not clear. There were no immediate confirmed reports of any deaths in Florida, on top of 24 people killed during the storm’s destructive trek across the Caribbean. Irma made landfall just after 9 a.m. at Cudjoe Key, about 20 miles outside Key West, forecasters said. By midafternoon, it was advancing at about 12 mph toward Florida’s southwestern corner, which includes Naples, Fort Myers and Sarasota. For days, forecasters had warned that Irma was taking dead aim at the Miami metropolitan area and the rest of Florida’s Atlantic coast. Forecasters warned that after charting up Florida’s west coast, a weakened Irma could push into Georgia, Alabama, Mississippi, Tennessee and beyond. A tropical storm warning was issued for the first time ever in Atlanta, some 200 miles from the sea. Tags: florida, Hurricane Irma, weather. Bookmark the permalink.